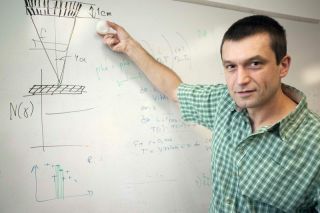 NASA scientist Maxim Markevitch is studying the feasibility of building a low-cost X-ray space telescope mirror from plastic tape and tightly rolling it like the Scotch tape in most homes and offices. The whiteboard drawing shows the shape of the X-ray mirror roll. Scotch tape, that transparent, sticky hero of offices everywhere, could be a NASA superstar as well. The rolled-up adhesive tape is the inspiration behind a novel idea for a completely new kind of X-ray mirror for big telescopes in space. The concept, dreamed up by NASA scientist Maxim Markevitch, is this: Instead of building an expensive telescope mirror to capture high-energy "hard" X-rays in space, why not create a mirror from tightly rolled plastic tape at a much lower cost? "I remember looking at a roll of Scotch tape and thinking, 'Was it possible to use the same design for capturing hard X-rays?'" Markevitch explained in a NASA statement. "I talked with a few people, and to my surprise, they didn't see any principal reasons why it couldn't be done." Several space telescopes already scan the heavens for X-rays today, including NASA's Chandra X-ray Observatory and black hole-hunting NuSTAR instrument, as well as Japan's New X-ray Telescope (which is also known as Astro-H). But Chandra is sensitive to lower-energy "soft" X-rays, and NuSTAR and Astro-H have limited collecting areas that allow them to only "graze the surface" of possible discoveries in the hard X-ray realm, Markevitch said. To really do the job, scientists need an imaging X-ray telescope with a collecting area perhaps 30 times larger than that of NuSTAR, he added. If such a telescope could be built, it could study galactic cosmic rays, super-fast subatomic particles generated in deep space. Scientists believe cosmic rays and the magnetic fields between galaxy clusters can alter the physics within clusters. A better understanding of these physics could reveal more about the birth and evolution of the universe, Markevitch said. But a telescope capable of making such finds using current technology — which would require building a large number of individual mirror segments, coating them with reflective material and them nesting them precisely inside an optical assembly — doesn't appear to be coming along anytime soon. "However, to our knowledge, nothing of the kind is planned or even proposed in the U.S. or elsewhere because of the cost something like this presents," Markevitch said. Markevitch and his team hope a new way of thinking could help push such a project along. Their idea calls for coating plastic tape on one side with multiple layers of reflective material, then winding the tape into a roll to form a large number of densely packed nested shells. This process could theoretically create a mirror with a huge collecting area, Markevitch said. While the team is currently testing candidate materials, the idea is still a long way from getting off the ground. "Maxim's Scotch tape idea is in an early stage," said team member Will Zhang, also of NASA Goddard. "In the next year, we will know whether it has a chance of working." If the tape does indeed work, it could be "game-changing for hard X-ray astronomy," Markevitch said. "It could significantly reduce the cost of building large mirrors, bringing within reach the possibility of building a mirror with 10 to 30 times greater effective area than current X-ray telescopes."